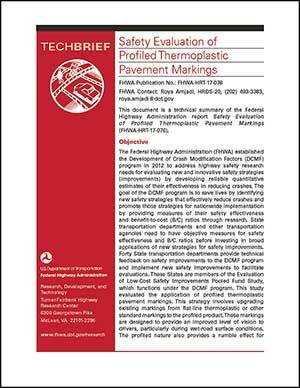 This document is a technical summary of the Federal Highway Administration report Safety Evaluation of Profiled Thermoplastic Pavement Markings (FHWA-HRT-17-076). The Federal Highway Administration (FHWA) established the Development of Crash Modification Factors (DCMF) program in 2012 to address highway safety research needs for evaluating new and innovative safety strategies (improvements) by developing reliable quantitative estimates of their effectiveness in reducing crashes. The goal of the DCMF program is to save lives by identifying new safety strategies that effectively reduce crashes and promote those strategies for nationwide implementation by providing measures of their safety effectiveness and benefit-to-cost (B/C) ratios through research. State transportation departments and other transportation agencies need to have objective measures for safety effectiveness and B/C ratios before investing in broad applications of new strategies for safety improvements. Forty State transportation departments provide technical feedback on safety improvements to the DCMF program and implement new safety improvements to facilitate evaluations. These States are members of the Evaluation of Low-Cost Safety Improvements Pooled Fund Study, which functions under the DCMF program. This study evaluated the application of profiled thermoplastic pavement markings. This strategy involves upgrading existing markings from flat-line thermoplastic or other standard markings to the profiled product. These markings are designed to provide an improved level of vision to drivers, particularly during wet-road surface conditions. The profiled nature also provides a rumble effect for errant vehicles. There are two types of profiled markings—raised and inverted profile patterns—as shown in figure 1 and figure 2.